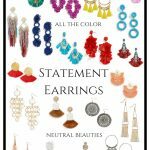 Well I couldn’t start sharing Spring outfit inspiration and leave out all the pretty Spring statement earrings that are hitting stores! Spring is my favorite season for statement earrings. I love the bright and bold colors, the simple styles, the sparkle. 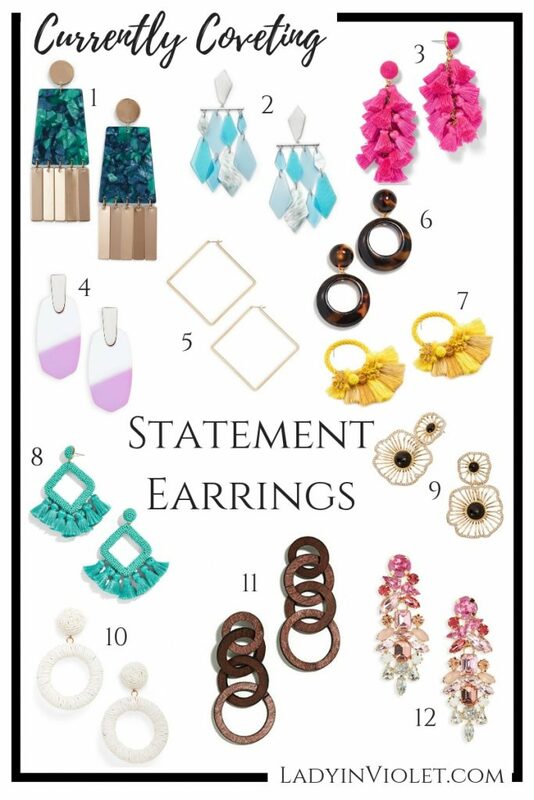 Oh so many good statement earrings come out in the spring! I rounded up some of my favorites this season trying to hit a variety of shapes, styles, sizes, prices, and colors. I love pairing the bold colors with my more lighter or neutral outfits. The white, brown, and gold are perfect add ons to the days you print mix or wear lots of color to add balance to your outfit. Don’t be afraid to mix colors too. The bold pink would be cute with a green dress, the bright yellow would pair perfectly with shades of blue, and turquoise earrings would be perfect with pink or red. Which pair do you have your eye on for Spring? Your picks are beautiful! My husband got me some statement earrings for Valentine’s day and I can’t wait to wear them for spring! I’m done with the dark colors!